From left: Mr. Paul Allen, Engineer at WIT; Captain Mark McDermott (CHC); Mr Albert Byrne, Head of Department of Engineering Technology WIT; Mr Hugh Breslin, Engineer at WIT; Dr James O’Sullivan, Technology Transfer Office WIT; Mr. Bryan Raleigh, Engineer at WIT; Ms Claire Fitzpatrick, School of Engineering WIT; Dr Ken Thomas, Head of School of Engineering WIT. 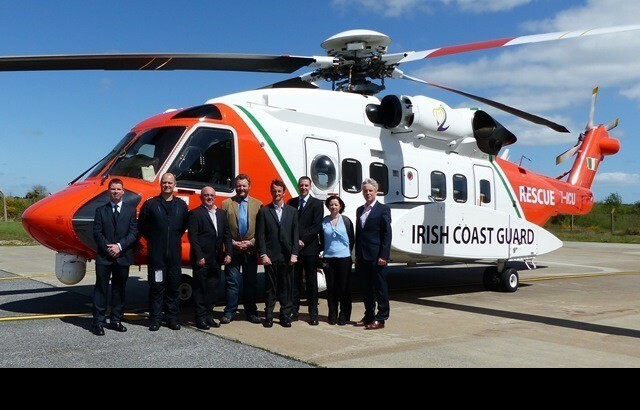 A collaborative endeavour between the Engineering Technology department at Waterford Institute of Technology (WIT) and CHC Ireland Ltd, who provide the Search and Rescue helicopter service on behalf of the Irish Coast Guard, has resulted in their project being shortlisted for the Innovation Award at the Irish Aviation Authority awards on Thursday 28th May 2015. The Sikorsky S92 helicopter based in Waterford, which is one of the most technologically advanced helicopters in the world, and costs approximately €30 million, often operates in very harsh environments, particularly at sea, and over time its advanced avionics may be affected due to moisture, potentially resulting in equipment failures or higher than normal replacement rates. WIT was asked to help develop an original concept which would enable the aircraft to be dehumidified, whilst retaining the ability to launch on rescues at extremely short notice. The team of engineers at WIT developed and patented a system that allows circulation of conditioned air through the helicopter when it is on standby, which does not require any attachment to or modification of the helicopter, thus facilitating quick deployment when a call out is received. The project was led by Mr Paul Allen who is a lecturer in mechanical engineering at WIT. Describing the project Paul said “The project is an excellent example of the positive contribution the institute can make to regional companies. The project has been mutually beneficial, WIT staff and students have also gained an insight into the engineering complexities of modern helicopter technology”. WIT offers engineering courses in a range of disciplines including Mechanical, Manufacturing, Electronic, Electrical, Construction, Sustainable Energy and Civil Engineering. See www.wit.ie/engineering.